I always like it when characters from one television show make an appearance on another television show.Â Itâ€™s a great kind of nod to another show and it really brings in a whole lot of different facts than can be played off of.Â The first instance of this I can remember is when the Bionic Woman shows up and spends some time with none other than Lee Majors.Â But now there is a feature length adventure that brings together not two, but three television shows and itâ€™s ready for you to bring home on DVD today! Starting this September 22nd, now available on DVD from Disney Channel and Walt Disney Studios Home Entertainment comes the full-length adventure that brings together characters from three hit television shows.Â Wizards On Deck With Hannah Montana is ready to come gushing out of your television screen and fill your living room with this exciting adventure that will put all hands on deck.Â Bring home this great crossover film today! Three famous tween shows collide in this feature length adventure.Â The S.S. Tipton is on a cruise to Hawaii and Justin just happened to win a ticked to the teen cruise.Â Not only that, but he has also won a chance to meet London.Â Then everything starts to get a little bit crazy.Â Justin and Max are competing for the attention of London, Cody is doing all he can to get some concert tickets for Bailey and Zack is accused of being a real prankster.Â But that all fades once superstar Hannah Montana gets on the ship.Â Yet when both Miley and Hannah lose something very important, what will happen to the cruise? The special features included in this DVD are the original essay video that got Justin and his siblings a spot on the teen cruise on the S.S. Tipton and some hilarious bloopers and great interviews with the actors from this film. If you are a fan of any of these three shows, you will enjoy this triple crossover feature length adventure greatly.Â I chuckled a couple of times, but it never really got any funnier for me than that.Â Of course, the great part of this movie will be being able to see some of your favorite characters in situations that you have never ever imagined that they could one day be in.Â Some of the best stuff on this DVD are the special features, where they talk to cast members from each respective show and find out what it was like to work with all of these combined stories.Â Itâ€™s a must have for all true fans. All hands On Deck for this great movie event today! 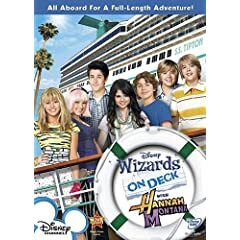 1 user commented in " Movie Review: Wizards On Deck With Hannah Montana "